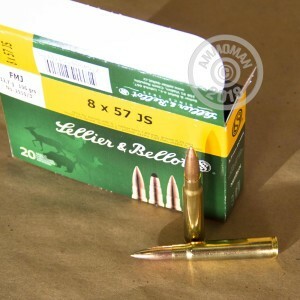 This 8mm Mauser ammunition from Czech manufacturer Sellier & Bellot makes an excellent range load for modern sporting arms and vintage military rifles alike. 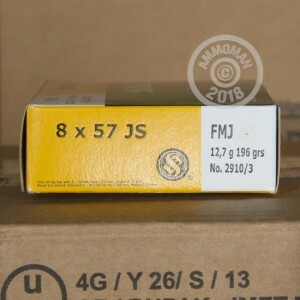 Each cartridge fires a heavy 196 grain full metal jacket bullet and delivers the excellent long-range accuracy that shooters of this powerful round demand. Sellier & Bellot ammunition uses non-corrosive Boxer primers and brass cases and enjoys a great reputation for delivering excellent shooting performance at a reasonable cost. 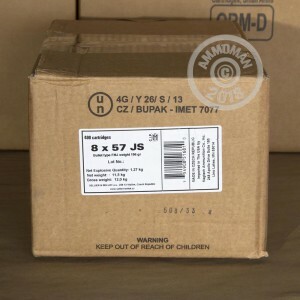 Order $99 or more worth of products from AmmoMan.com and get FREE shipping!